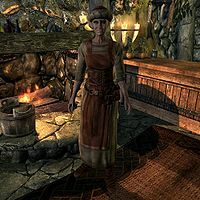 Frida is an elderly apothecary who runs The Mortar and Pestle in Dawnstar. Years ago, her husband died while searching for the Ring of Pure Mixtures and she will ask you to finish what he started. She sleeps above the main trading room every night between midnight and 8am. She then heads downstairs where she unlocks the front door and positions herself behind the counter, offering her services for twelve hours. At 8pm she leaves the store and heads up the hill for a four-hour visit to Windpeak Inn before bedtime. She wields an iron dagger, and carries the shop key and some common items and gold. She wears a regular set of merchant clothes with boots and a hat. When you arrive in Dawnstar for the first time and enter the store, Frida will invite you in: "The Mortar and Pestle makes potions, if you can't tell from the name. Just step up to the counter. ", "A Stamina Potion maybe? Popular with young men." or "The Mortar and Pestle has cures for every illness, from Ataxia to Witbane." Before Waking Nightmare she will add: "No. I don't have anything for bad dreams, so don't ask." If you meet her outside her shop, she will instead say: "Frost took my husband years ago. He was a good man." and "My children all grew up and left Dawnstar to make their fortune." When asked how long she's lived in Dawnstar, she will tell you her story: "Pfft. I'm the oldest woman in Dawnstar. Was here when the Skald the Elder was Skald the Younger. He's a fool, if you haven't met him already. Thinks Ulfric Stormcloak is invincible and spits dragon fire. The people here look to Brina Merilis when they need things settled. Real firebrand going [sic] up. Wasn't surprised when she joined the Legion." When asked about how she picked up the herb trade, she will tell you about her deceased husband and give you a task: "My husband. We used to go out in the wilds and collect ingredients together. He used to call me his 'pretty Juniper.' It's quite romantic, if you're an alchemist. Frost took the old fool a few seasons back, while he was looking for the Ring of Pure Mixtures. I found the ring's resting place after he died, but I'm far too old to go exploring some cave, now." If you refrain from helping her she will say: "Why am I not surprised?" If you offer your help, she will be grateful: "Well, aren't you sweet? I'd be happy to give you some alchemy training in exchange for the ring, if you bring it to me." She will end all conversations with "Let me know if you come down with the Rattles". or, if you accepted her quest, "If you find that ring, bring it here." When you return with the ring, she will be grateful and provide some free Alchemy training: "Thank you. Here, let an old alchemist pass on some of her secrets to you." If Brina is appointed Jarl of Dawnstar, she will express her support, saying, "Seems Brina Merilis and the Legion came and now she's Jarl. That's a relief. I don't like the fighting, but Brina is the woman for the job." When Frida spends time at the Windpeak Inn, she can often be seen talking to either barkeep Thoring or local bard Karita. Frida: "Now, who was it that kidnapped the Jarl's son 20 years ago?" Thoring: "You mean Hildolf the Skull-Splitter? Remember when we rounded up the townspeople and dragged him out of that cave?" Frida: "Those were the days. I'd never seen my husband fight so bravely before." Thoring: "Aye, to your husband. Divines bless his memory." Frida: "Thoring, do you remember the time when that wolf pack come clamoring into town?" Thoring: "How could I forget? That old alpha male almost took off my leg." Frida: "Never did find out why they came sprawling into town like that." Thoring: "Animals in the Pale don't need a reason to attack Dawnstar. It's just their nature." This page was last modified on 10 July 2016, at 08:59.